The School of Engineering at the University of Edinburgh is celebrating 150 years since Queen Victoria bestowed a Regius Chair of Engineering to the University. 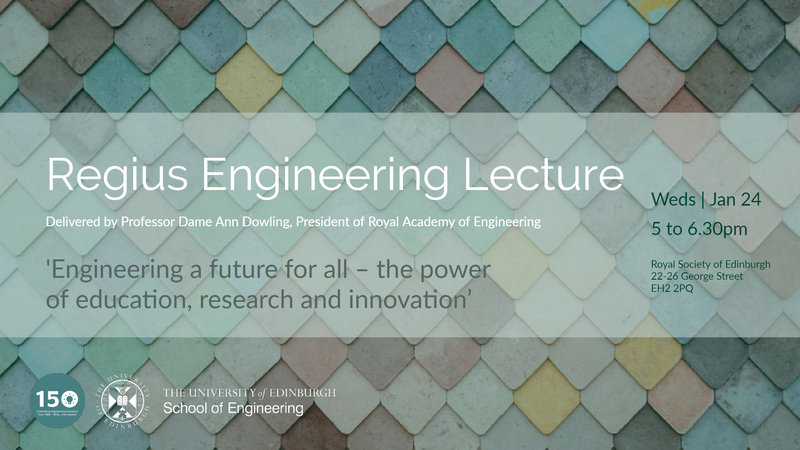 In celebration of this, the School is hosting its first Regius Engineering Lecture, delivered by Professor Dame Ann Dowling, President of the Royal Academy of Engineering. Dame Ann will be discussing 'Engineering a future for all - the power of education, research and innovation'. The lecture will begin shortly after 5pm at the Royal Society of Edinburgh and there will be time for questions afterwards. You can watch this video on Media Hopper.